Sometimes even the seasoned theatre-goers get to be surprised, elated and dazzled by the performance less expected. 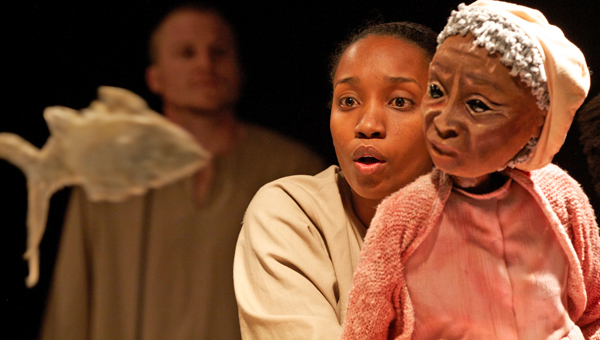 EMILY GAMBADE encountered such brilliance at Cape Town's Baxter Theatre's “Ouroboros”. Cape Town’s cultural scene is evolving, offering a rather interesting, sometimes unexpected, mix of professional and amateur performances. Surprisingly enough, under the same roof, on the same night, one might find anything from a super-production to a rather disturbingly poor performance. It is not an easy task to find out prior to a show what it will lead you to: pure euphoria or staggering disappointment. Reading what the play is about might help. Buying the programme can give you some direction. But the best way to find out is always to buy a ticket and experience it. And at the end, make up your own opinion. Because some plays, no matter how descriptive the programme is, no matter how strong the PR is that backs them up, are indescribable. They have to be seen, heard and felt. This is the very beginning of a journey into a parallel world, where puppets talk and fishes fly. This is the very beginning of an unconventional play, where hearts hide in suitcases and death rows in an aerial bark. The play is the love story between a poet and a dancer, based on the words of Billy Collins, a contemporary American poet. It is ultimately a ballet of puppets floating over the audience, with human hands, feet and souls holding them like precious divinities. The care and attention given to each puppet is heartening. The flow of bodies moving under each character is a silent performance, dragging the audience into a parallel world where nothing seems real and palpable. The facial expressions of the puppets are perturbing. Your mind tells you the features are motionless yet your eyes see frowns, pouts, glowers, blinks and smiles. How does the magic happen? How can fixed faces look at you in all their glorious static paper shapes, a few meters away and express feelings to the point where you see them? 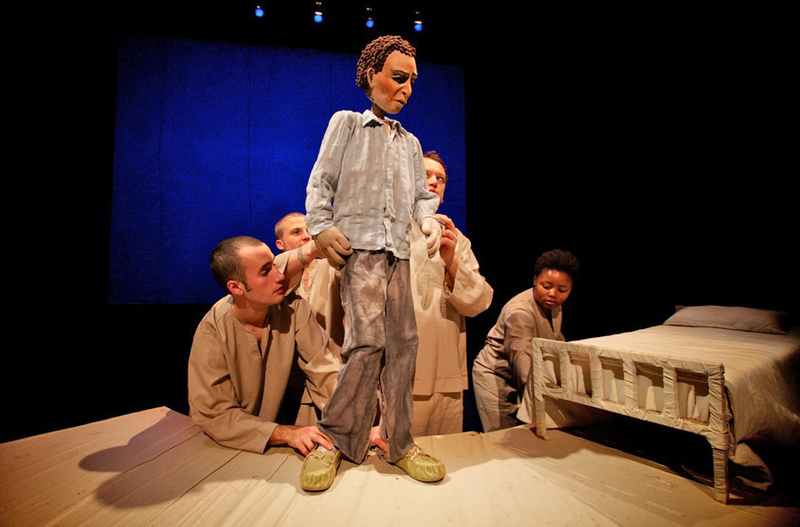 The secret may lie in a “rigor in the movement and gesture” as stated by puppeteer Basil Jones, which will have the audience sense even the most imperceptible motion of the puppet. 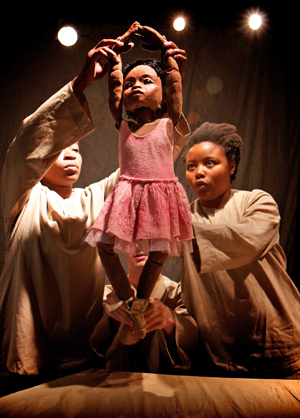 It may also rest in the combined work of director Janni Younge, the Handspring Puppet Company, puppeteers Adrian Kohler and Basil Jones, composer Neo Muyanga, light designer Mannie Manim and Mamela Nyamsa for the choreography. Plus an impeccable cast of puppeteers, carrying the play in the palms of their hands. “Ouroboros” runs at the Baxter Theatre from 1 to 11 June with ticket prices from R60 to R130 through Computicket or any Shoprite Checkers outlets countrywide. Follow the production on Facebook and Twitter.